Do your bass tracks need some low-end love? Maybe a little bite? Usually this takes a few plugins but Audified have combined several plugins to make ToneSpot. 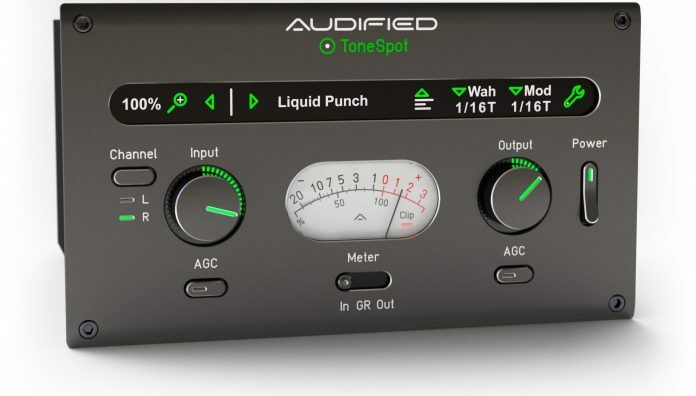 BRNO, CZECH REPUBLIC: host application and audio effects developer Audified is proud to announce availability of ToneSpot Bass Pro — presented as an abundantly powerful channel strip plug-in with an impressive, user-friendly GUI (Graphical User Interface) that provides professional processing power to let users shape their bass tone to fit any musical genre, perfectly aiming the company’s trailblazing ToneSpot series Swiss Army knife-style solution for all tone hunters as an appropriately-named opening salvo. For those to whom ToneSpot Bass Pro presents too much of a financial stretch still… ToneSpot Bass Express — featuring the same processing power as its bigger brother, but with a reduced control count — is coming soon!